As a rule, during sleep, we do not even think about reality or not. Lucid dreams are dreams when you know and understand that now sleep, and all the images that flash before my eyes is nothing more than a dream. Once a person understands this, he can generate the plot in its sole discretion. For example, many people in their dreams fly. 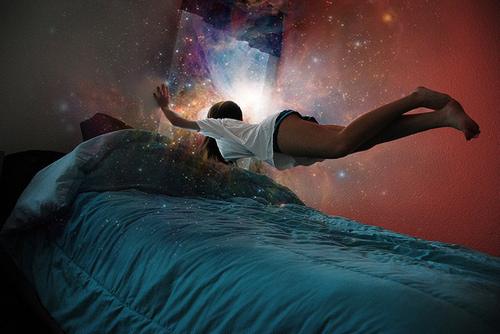 Most of the population never enter a state of lucid dream, and therefore can not even imagine how great it is. Stephen Laberge conducted a series of experiments that scientifically confirm the existence of lucid dreaming. In the dream, the man locked all the muscles – this is done to avoid sleepwalking, but one still continues to move – is an ocular muscle. Laberge agreed with his subjects that as soon as they start coming in a lucid dream, the eyes need to make a few moves up and down, left and right. After several successful experiments could be no doubt. Lucid dreams do exist. How to learn lucid dreaming? It is not so difficult, but requires a certain time. For the first time as often as possible you need to think about this phenomenon, if you have the desire and ability, it is good to read books on the subject. It starts with practice. The dreams we dream every night, but do we always remember? Keep beside the bed notebook and pen and immediately after a dream write down what I remembered. Scientists say that if the dream doesn't remember in the first few minutes, it will forever lost in our memories. Everything is simple. For example, all of your dreams 3% is lucid dreaming. A chance to remember them, if you do not remember what you dream? Critical thinking is the most important thing in achieving lucid dreams. As often as possible ask yourself "if I sleep now or what is going on really?" Here, too, everything is simple. If you don't ask yourself about this reality, why do you have to ask yourself when you sleep? A lot of works devoted to this subject. A huge number of practices withdrawn. If you are interested, be sure to find out about it. From myself I can add that I occasionally are in a state of conscious sleep. I know how to do this from early childhood, so no specific practices, I did not feel myself, but personally know people that are fulfilling the above points, achieved success.